Rod Marler Director Panuku Development. Rod has more than 30 years’ experience delivering large and complex projects. He joined Waterfront Auckland at its inception in November 2010 following an eight-year role as General Manager Design, Westfield New Zealand. He holds a degree in Architecture and an MBA, both from Auckland University. 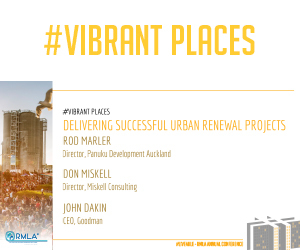 Don Miskell ONZM Director – Don Miskell Consulting. Don is former Deputy Director of the Christchurch Central Development Unit (CCDU), the development arm of the Canterbury Earthquake Recovery Authority (CERA). Between 2000 and February 2012 Don led Boffa Miskell, a multi-disciplinary environmental design planning consultancy first as Chairman and then as Managing Director. As a consultant, Don worked on large multidisciplinary assessment and master planning projects. Don’s experience spans a range of sectors including property development; tourism; education and health; transport, energy and mining; and primary production. John Dakin Chief Executive Officer and Executive Director. John has been the Chief Executive Officer of Goodman in New Zealand since 2004. He is responsible for the overall management and operations of Goodman Group’s New Zealand business. John has over 25 year’s of experience in the property industry, including property and corporate transactions, valuation, research, asset management and investment management. During his career John has held senior roles in the United Kingdom, Australia and New Zealand. John was appointed to the Board in July 2012.